The Mt. Pleasant Panther baseball team won 4-1 over Washington on the Demons home field Saturday night by a 4-1 score, that loss to the Panthers ended the chances for Washington to tie with Fairfield for the conference title. Fairfield wins the league with a 13-3 record, M.P. and Washington tie for 2nd at 11-4. Jordon Magnani was the winning pitcher with relief help from Zach Beason. Colby Potts had two hits and Chase Lamm added a double to lead the Panther offense. MPHS wraps up the regular season at Community Filed in Burlington Tuesday against the Burlington Grayhounds, JV game is at 3 pm and varsity to follow. 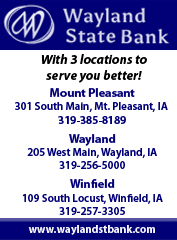 TOURNAMENT BASEBALL RESULTS FROM SATURDAY NIGHT: CLASS 1A: Danville downed Winfield Mt. Union 18-8 in 6 innings, the Bears play New London on the Tigers field Tuesday at 7 p.m. KILJ-FM 105.5 and kilj.com will broadcast the game live. Holy Trinity Catholic will play Burlington Notre Dame at 5 pm at New London also. Keokuk beat North Scott 9-6, Cedar Rapids Xavier downed Iowa City Liberty 1-0, Keokuk and Xavier play the championship at Xavier Tuesday night at 7 pm. Fairfield beat Oskaloosa 6-4 and Newton beat Washington 3-1, Fairfield plays at Newton Tuesday at 7 pm in the championship. New London won over #8 Sigourney 2-0 in Friday’s Class 1A Regional semifinal at Sigourney. Sofie Reighard scored both Tiger runs, one on a passed ball, then Camryn Blint’s RBI single in the fifth inning scored Reighard with an insurance run. Blint was the winning pitcher, allowing just three hits while striking out 10. Carson McSorley had two hits for the Tigers. Tonight New London (19-9) hosts (21-8) North Mahaska in the Regional final at 7 pm, North Mahaska beat Lynnville Sully 3-1 in the other semi-final. KILJ-FM 105.5 and kilj.com beginning at 7 pm WINNER GOES TO STATE and will open play on Monday July 16th action begins at 11 am.